A photographer films a gilded silver mummy mask found on the face of the mummy of the second priest of Mut, as it is displayed during a press conference in front of the step pyramid of Saqqara, in Giza. Archaeologists say they have discovered a mummification workshop dating back some 2,500 years at an ancient necropolis near Egypt’s famed pyramids. 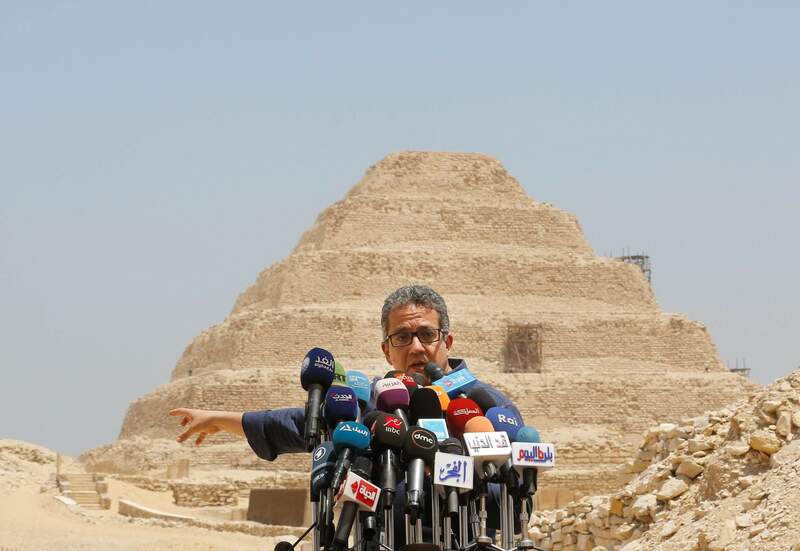 Antiquities Minister Khaled el-Anani, speaks during a press conference in front of the step pyramid of Saqqara, in Giza. Archaeologists say they have discovered a mummification workshop dating back some 2,500 years at an ancient necropolis near Egypt’s famed pyramids. Recently discovered mummies are seen at at a mummification workshop dating back some 2,500 years at an ancient necropolis near Egypt’s famed pyramids in Saqqara, Giza. 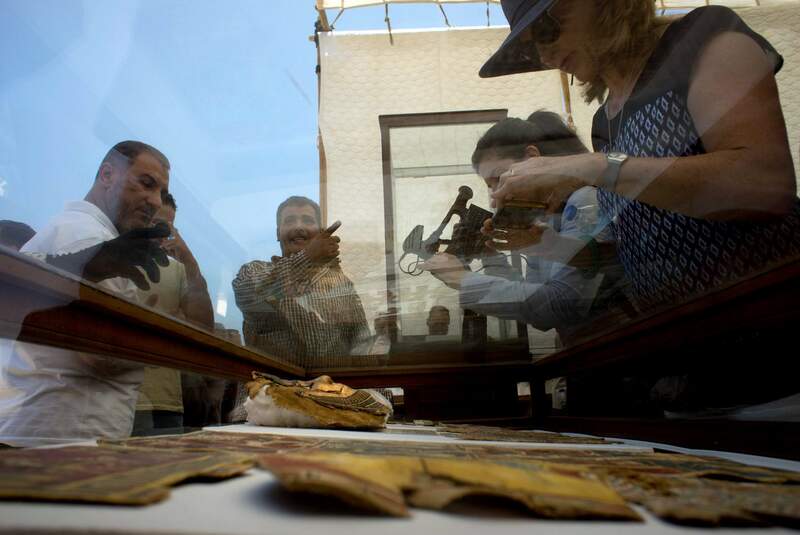 Antiquities Ministry officials said at a press conference that archaeologists hope the find will reveal more about the secrets of mummification in the 26th dynasty of ancient Egypt. Recently discovered mummies are seen at a mummification workshop dating back some 2,500 years at an ancient necropolis near Egypt’s famed pyramids in Saqqara, Giza. 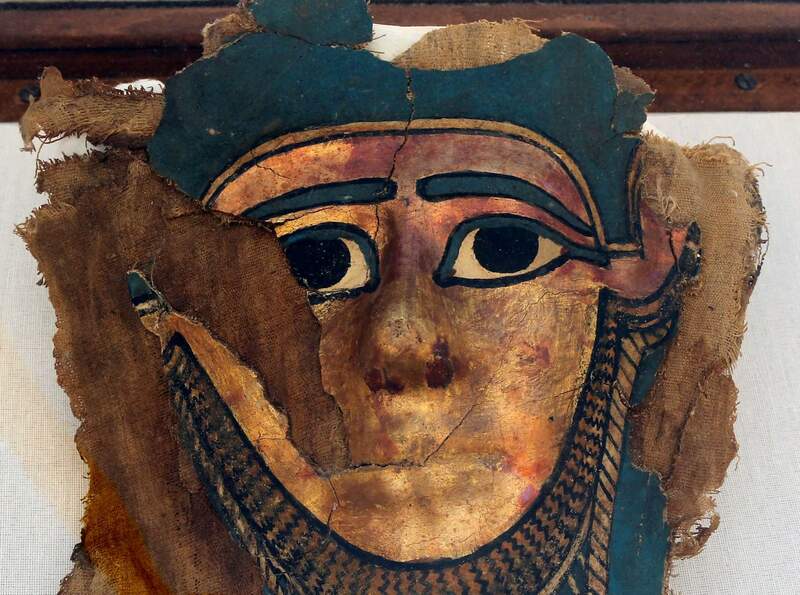 Antiquities Ministry officials said at a press conference that archaeologists hope the find will reveal more about the secrets of mummification in the 26th dynasty of ancient Egypt. Reporters film recently discovered gilded mummy mask found in a disturbed context of the hall way of a burial chamber dating back some 2,500 years at an ancient necropolis near Egypt’s famed pyramids in Saqqara, Giza. 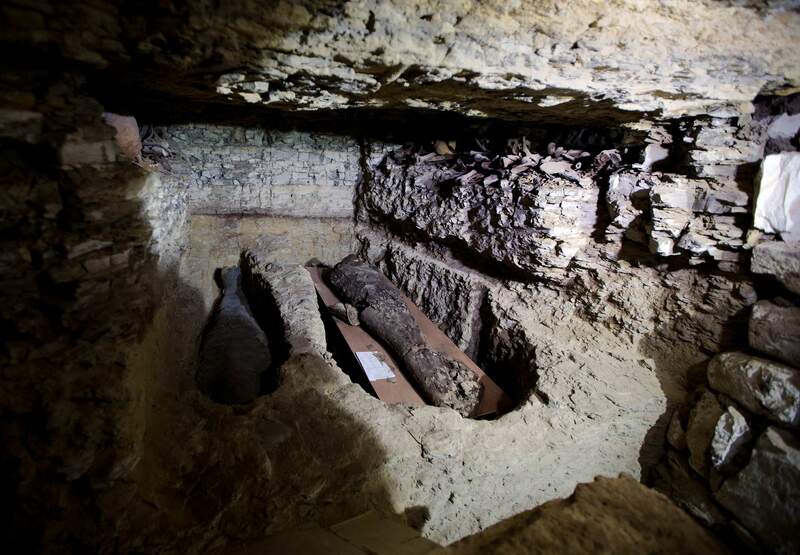 Antiquities Ministry officials said at a press conference that archaeologists hope the find will reveal more about the secrets of mummification in the 26th dynasty of ancient Egypt. 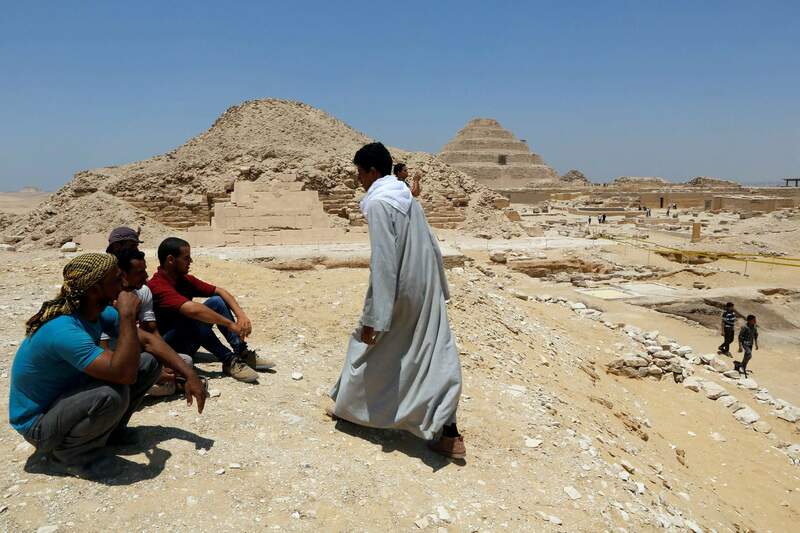 Excavation workers take a rest in front of Unas Pyramid, left, and the step pyramid of Saqqara, in Giza. Archaeologists say they have discovered a mummification workshop dating back some 2,500 years at an ancient necropolis near Egypt’s famed pyramids. 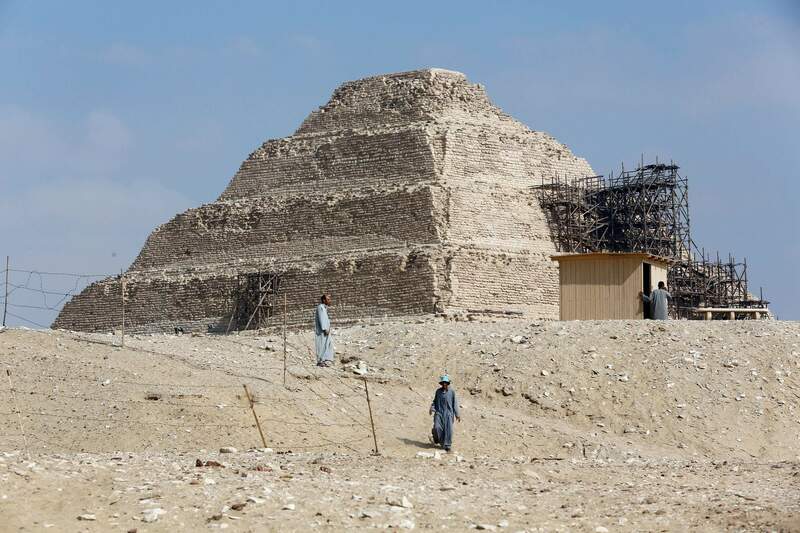 Excavation workers walk in front of the step pyramid of Saqqara, in Giza. Archaeologists say they have discovered a mummification workshop dating back some 2,500 years at an ancient necropolis near Egypt’s famed pyramids. CAIRO – Archaeologists in Egypt stumbled upon a new discovery dating back to more than 2,500 years ago near Egypt’s famed pyramids at an ancient necropolis south of Cairo. The latest find, announced at a press conference in July, belongs to the Saite-Persian Period, from 664-404 B.C. The site, which lies south of the Unas pyramid, was last excavated more than 100 years ago, in 1900. 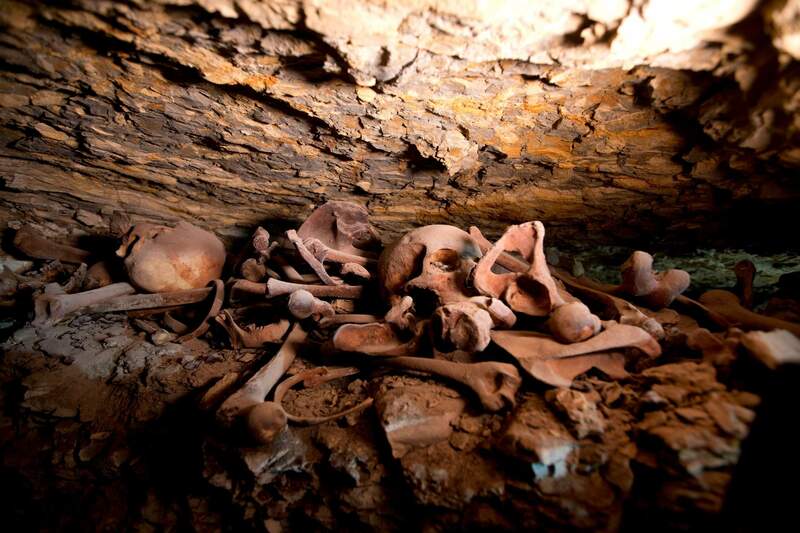 Recently discovered skulls and bones are seen at a mummification workshop dating back some 2,500 years at an ancient necropolis near Egypt’s famed pyramids in Saqqara cemetery, Giza. 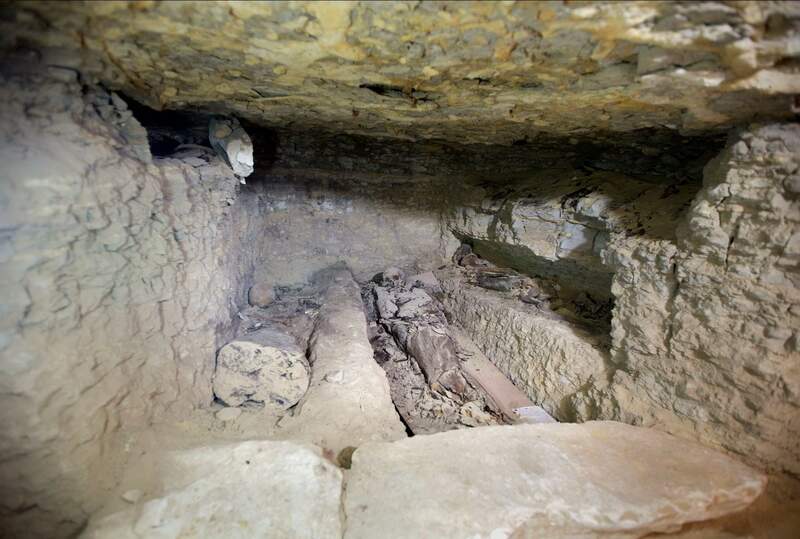 Antiquities Ministry officials said at a press conference that archaeologists hope the find will reveal more about the secrets of mummification in the 26th dynasty of ancient Egypt. A recently discovered gilded mummy mask is displayed after it was found in a disturbed context of the hall way of a burial chamber dating back some 2,500 years at an ancient necropolis near Egypt’s famed pyramids in Saqqara, Giza. 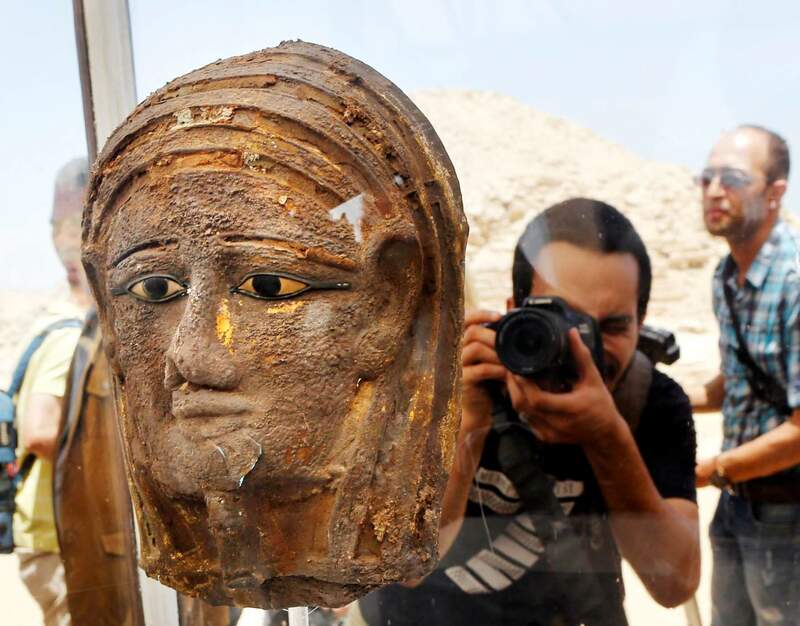 Antiquities Ministry officials said at a press conference that archaeologists hope the find will reveal more about the secrets of mummification in the 26th dynasty of ancient Egypt.